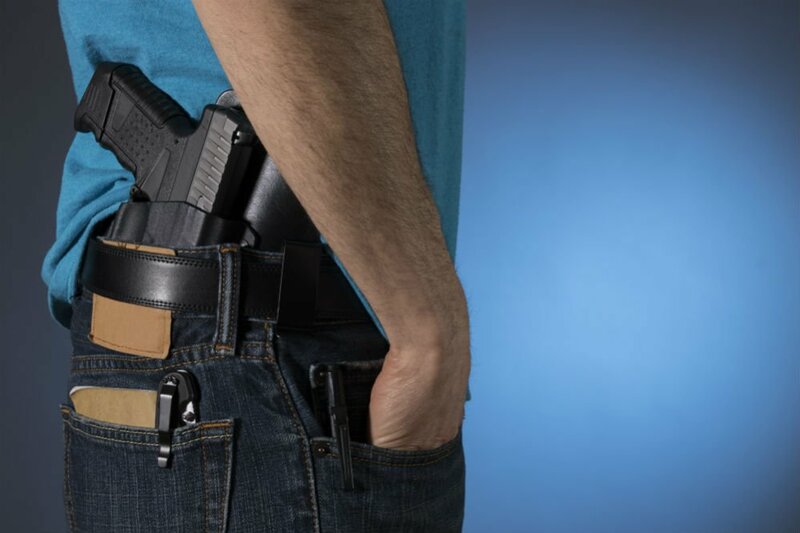 IWB (Inside the Waistband) holsters are a preferred choice among many gun owners for several reasons, most notably for the excellent concealment they offer for their firearm. This range of gun holsters can be tucked away neatly under your waistband, and then veiled with your shirt whether tucked in or not. Buying the best IWB concealed carry holster however can be a tricky task owing to the plethora of options available, each with their own set of features. 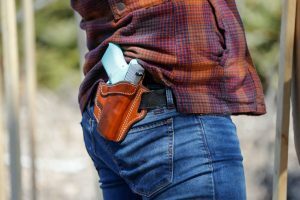 But we’ve scoured this space, compared several options alongside, and present you with the three best IWB concealed carry holsters you can use to discreetly secure your handgun inside your waistband. The Lirisy Belly Band IWB holster is truly in a league of its own with its ambidextrous design, which allows you to draw your gun with both your right and left hand. Additionally, this IWB gun holster is a joy to wear owing to its soft, neoprene material craftsmanship that provides the right amount of ventilation, allows it to breathe easy, is lightweight and doesn’t break a sweat. Measuring 5 inches wide x 42 inches long, the Lirisy Belly Band Holster features a one size fits all design that is perfect for up to 45” waistlines, and a strong snap button for easy release of your weapon. The Lirisy Belly IWB gun holster is designed to accommodate most handguns including Glock 17, 19, 42, 43, Beretta and Springfield. It comes with a movable pouch to store an extra weapon or cash anywhere on the length of the band. The Concealed Carrier IWB holster is crafted from plush, padded and breathable surgical-grade neoprene, complete with air holes for superior ventilation. The interior of the holster is pampered with soft foam to prevent rubbing or irritation when carrying your weapon. Available in a choice of right and left hand orientation, the Concealed Carrier IWB gun holster is designed to accommodate any size handguns starting from a sub-compact Glock 27 all the way up to a full-size .45 1911. It can be placed easily on your hip, back or even appendix level with its sturdy metal belt clip, and can be opened with just a flick of the retention strap. The package includes an extra magazine pouch, which can be used to carry a knife, extra magazine or even pepper spray. The Creatrill Inside the Waistband Holster makes it to our list of best IWB concealed carry holsters for several great reasons starting with its 3 layer material construction. The exterior of the holster is made from neoprene material, which is soft and breathable, while the durable polymer stiffening insert located in the middle allows it to stay opened for easy re-holstering and prevents accidental movement of the trigger. Topping it off is the robust 600D nylon interior for excellent protection against wear and tear. The Creatrill Inside the Waistband Holster is an excellent choice for most size handguns including Glock 26, 27 and 28, Ruger LC9, Springfield XD Series and Taurus Slim Line. It can be ordered in a choice of right and left hand orientation, and is fitted with a heavy duty metal clip to place the holster securely on your belt or waistband. IWB holsters offer several benefits for handgun owners, most notably that they allow discreet and secure concealment of your weapon. All the three best IWB concealed carry holsters mentioned on our list are made from high quality, breathable and lightweight neoprene material, so they should last you for years to come with proper care. The Lirisy Belly Band Holster showcases an ambidextrous design, making it a great choice when drawing your gun from both right and left hands, and for both men and women. All these holsters are designed to fit most compact and sub-compact pistols, and the Concealed Carrier and Creatrill holsters can be ordered in right and left hand orientations if you prefer their metal belt clip design. While all three holsters are the best you can get in this segment, the Lirisy Belly Band Holster takes home the gold, because it is not only a great fit for both right and left hand users, but also features a one-size fit design which is comfortable for both men and women with up to 42” waistlines. As a bonus, it even comes with an extra movable pouch for you to store an extra magazine or other valuables.